It’s so easy fall into a negative trail of thought when things don’t go as planned. You have a vision and you’re so passionate about pursuing it that you forget one, very crucial, thing. You can’t control what life throws at you! Yes, it can be annoying. Yes, the plan may not go smoothly. And yes, it may take longer. But that doesn’t mean that the goal is out of sight! Instead of seeing your circumstance as a problem – see it as a challenge. Instead of thinking about all of the things it has prevented you from doing – consider it as an opportunity to strengthen you. A positive attitude can seriously produce amazing results! After all, if you keep looking for what isn’t there, that’s all that you will see. And by doing so you’ll also miss out on all of the amazing opportunities that could have been. Don’t waste time wishing that you could control the uncontrollable. Instead, focus your energy on controlling the controllable… starting with your thoughts! 1) The quality of your thoughts determines the quality of your life. 2) Success does not come from what you can do. It comes from overcoming the things you thought you couldn’t. 3) Don’t be pushed by your problems, be lead by your dreams. 4) We tend to forget that happiness does not come from getting what we want, but appreciating what we have. 5) Believe in yourself when no-one else does or no-one will believe in you. It all starts with you. 6) Don’t focus on, and make excuses for, why you can’t; focus on all the reasons why you must. 7) Behind me is infinite power. Before me is endless possibility. Around me is boundless opportunity. 8) Get rid of your limited and lacking mentality. you have greatness in you, make the choice to use it. 9) Don’t settle for average. Average is just as close to the bottom as it is the top. 10) Setting goals is the first step to making the invisible, visible. 11) Either you run the day or the day runs you. Don’t carry yesterday’s problems with you today. Today is a brand new day – start it with a positive thought. 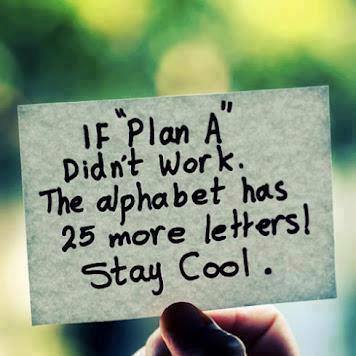 If things don’t go as planned, guess what? There’s still plenty of other ways to make it happen. You just have to find them. Today can be amazing – if your thoughts permit it.